The best RUNNING Quiz ever!! The other day… I was reading blogs. I came across one of my favorites thedancingrunner. 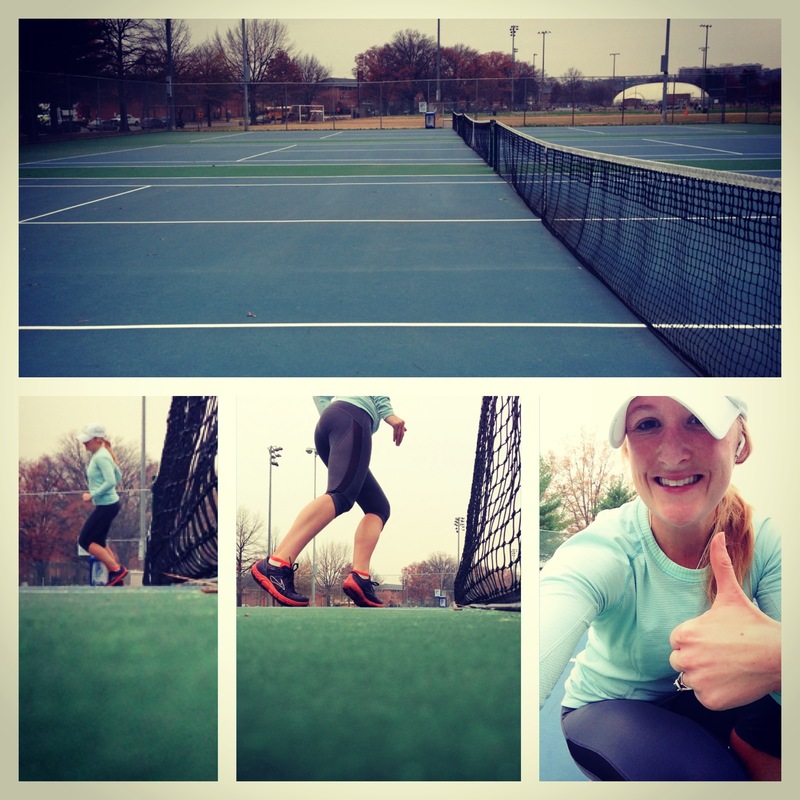 Chelsea, owner of the blog – thedancingrunner, posted a running quiz. Because the quiz made me laugh, and was really fun to take, I decided to share it with you. Aren’t you curious how much does running rule your life? let me know what your score is. Oh… and I have been squatting everyday of the month of September. This is Day 4 of Sweat a Day! Comment below with your quiz scores… and tell me which part of the quiz was your favorite. Also who’s squatting this month? What’s your favorite squat? I use Instagram for fitness inspiration all the time. 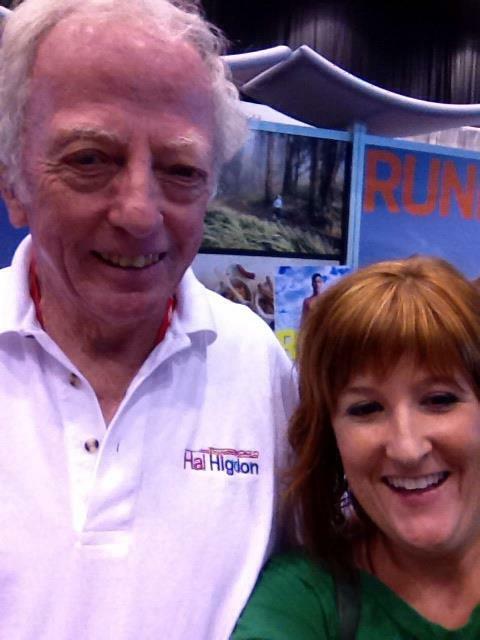 I have been following @shauna_harrison. She is a sponsored athlete for Under Armour and is the creator of the monthly Sweat A Day. I’ve wanted to try her monthly challenge Sweat A Day for a little over a year. Finally, this month, I am doing it. September is all about Squatting. Check out the September calendar. If you decide to join the challenge, take a photo or video of yourself doing the challenge daily and hashtag #sweataday. Also tag @shauna_harrison. Feel free to tag me as well @dorseyml. Seeing more people doing challenged like this inspires me to challenge myself. Here I go… Day 2 of Sweat A Day. Single Leg Squat. I did 3×10 for each leg. I am not really good with this type of squat. However, I am very proud I tried it. I’ve always wanted to try it but didn’t know how to go about it. I am hoping with practice I will eventually be able to do this type if squat with out the support from the wall and ball and maybe eventually add weight. But for the time being the wall and ball give great support so I can focus on form. I love this squat because you have to balance, which really works your core. My friend Raiza, told me another variation to try is with the TRX. I’m pretty obsessed with the TRX so I can’t wait to try the single leg squat on that. I’m back at it!!! Bring it on September!!! Attention Runners: New Running App. Two weeks ago, my friend Delia tagged me in a Facebook status. I was thankful she did. It was because of her that I discovered this really cool running app. This app is different from any other running app you have tried before. Here is how it works. 2) Once downloaded press the activate button. Once you activate it you have one full week to run as many miles as you can. 3) Before each run press the button that says start my run. 4) It begins tracking your run. 5) After each run press the button that says stop run. 6) Make sure you register. So everyone knows who you are and how many miles you have run. Are you an annoying runner? In the April issue of Runner’s World, there is a short article titled, Annoying? Who Us? It was way too funny not to share. As a runner, I know I am guilty of annoying quite a few of my family members, co-workers, friends, Facebook acquaintances, etc. especially during marathon season. But honestly, I don’t care. Some people may think my running behavior is an obsession. Some people may think I am addicted to running. But these people who are annoyed are not runners. Running is my passion and only other runners can truly understand. My favorite part about the article in Runner’s World is about running stickers. To my readers who are runners: Do you have a running sticker on your car? How many do you have? 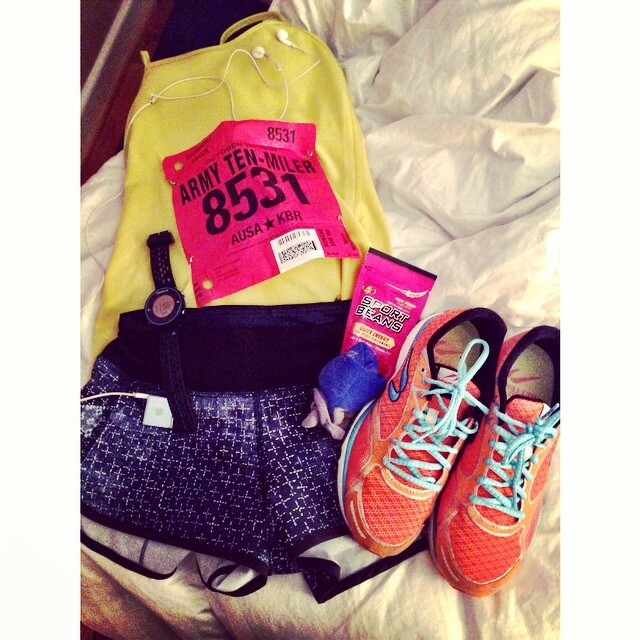 What do they say… 26.2, 13.1, runner girl, ultra marathon? The article compared a runner with a lot of running stickers to a crazy cat lady. This made me laugh out loud, because it is so true. 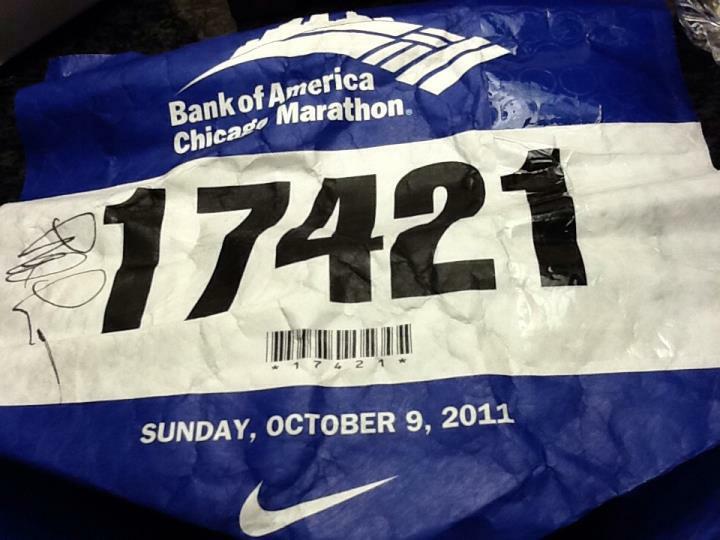 I have one sticker on my car, 26.2, but there are some runners who have their whole bumper covered. And although, you may be the runner who has 10 running stickers on your car, we get it running is your passion- while this may annoy others it doesn’t bother me at all. Just like a crazy cat lady who has 10 cats, you just love your stickers. However, what annoys me and what I think is the ultimate running offense is being a stuck up runner. I have written about this before, but just because you run an ultra marathon doesn’t mean you are more fit then someone who runs half marathons or full marathons. 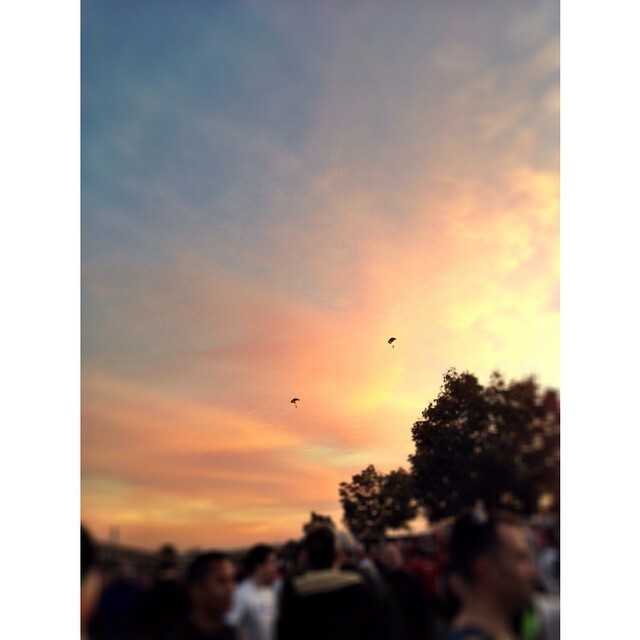 People run different distances for different reasons. I also get annoyed when runners put down 5ks, fun runs, tough mudders, Ragnar relays. I have heard some runners, put these races down saying, “that’s not really running.” Races like these can help get more people running races. A fun run 5k may be someone’s first race. Running this race, may help them fall in love with running, making them ready to try a longer distance. Although, I have yet to try a tough mudder, races like these are totally different than a road race or trail race. But having races like a tough mudder gives the running community more race variety. Race variety and how diverse the running community has become is one of the reasons I love this sport. As a runner, all I do is run, and when I’m not running, I’m talking about running. This is the annoying offense I’m guilty of. I have great conversations and connect well with other runners. 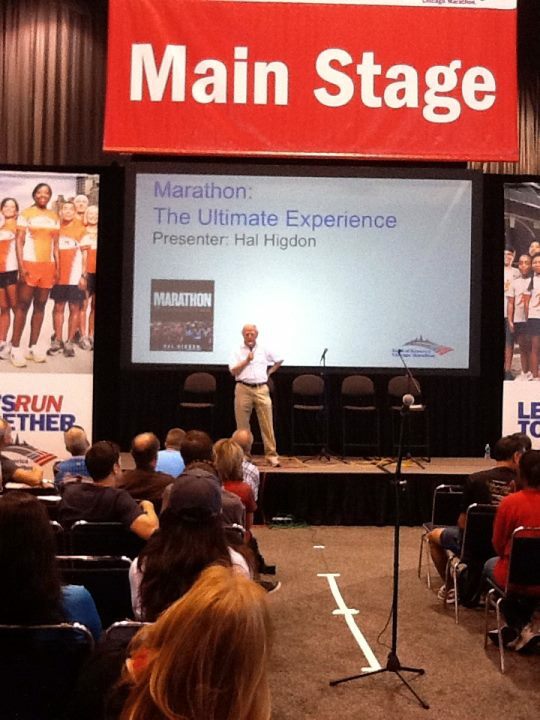 But for those who don’t run, I am hoping to inspire and share as much knowledge as I can. Now at the salon, a lot of my other co-workers have gotten the runner’s bug. I hear my co-workers Katie and Marlene talking about running as much as I do. Katie just completed her first 5k and Marlene set a new PR on her second 5k. This makes me smile! I love that more and more people are becoming runners. Us runners may sound annoying sometimes, but we mean well. We are passionate people, just trying to inspire, seek answers to our running questions, and trying to share our very own running experiences. What are you guilty of? What annoys you? OMG! I am having workout/running withdrawals!! I ran the Cherry Blossom 10 miler last sunday and then ran the Parkway Cassic 10 miler this past Sunday. I had to head straight to work right after both races. During the week my mornings have been packed full with work meetings, dentist appointments, and coaching classes. I have only had a chance to hit the gym so far on Tuesday. I hit shoulders pretty hard though. I am excited for this weekend. I can’t wait for tomorrow. I plan on waking up early and working back and legs in the gym, followed by a 5 miler. I also might hit the track. I plan on hitting the gym Saturday and then doing a long run on Easter Sunday! Not being able to run and workout as much as I usually do during the week had made me annoyed and tired! But it also makes me eager to go all out and get some high quality workouts in! Is anyone else doing a long run on Easyer? I always thought if you want to run fast you need to practice running fast. But after learning more about heart rate, I am now beginning to realize this is not always the case. 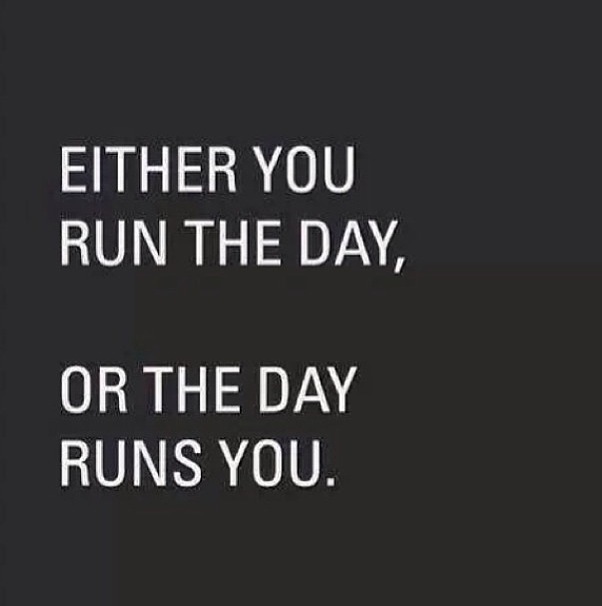 To all of my readers who are runners what do you think about the above quote? Do you always try to run fast? Does fast running during training make you race faster? As a hair stylist, we talk and listen all day long… it comes with the job. Our clients need to tell us stuff, and they are always asking what’s new and exciting in our lives. Our salon is on the small side, and in most cases hair stylists are loud people, so it is a very hard task to avoid your neighbors conversation. Lately, every other person I come across is starting to run. Woohoo, this makes me happy. Two of my lovely coworkers who are new to running are the first people who come to my mind. Along, with them being new to running, comes a million running questions. Once you become a passionate runner and you start training for your first race (whatever length you choose) running finds its way into every conversation. I talk a lot about running to my clients and now running is among the conversations these two coworkers have with their clients as well. We are not the same. What works for one runner, may not work for another. I mean this in every way. What shoes work for one runner, may not work for you. 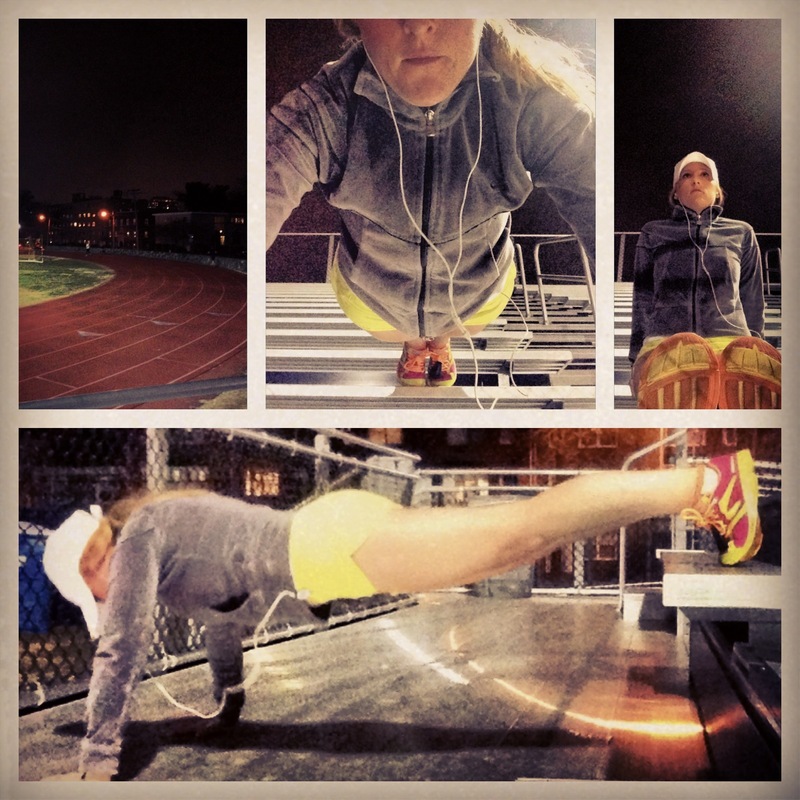 What training program works for one runner, may not work for you. What race strategy work for one runner, may not work for you. 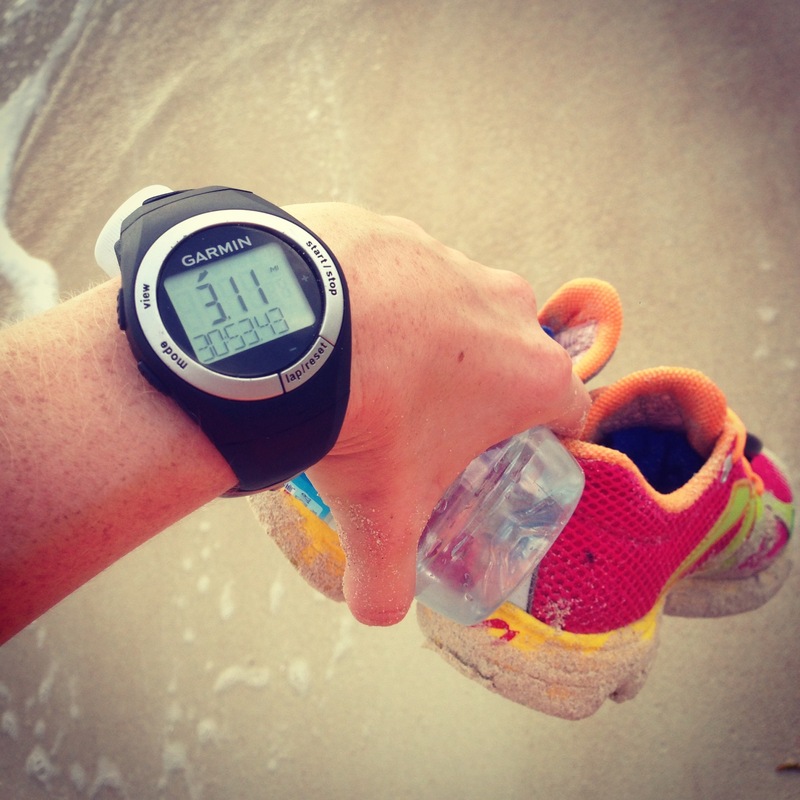 Some may prefer a camel back for long run hydration, while others may prefer a water belt. Some may drink nuun while others prefer water. Some may refuel with sports beans others may like gu. Some may run everyday, when others need more recovery to prevent injury. And the list goes on… But you get my point. It is good to ask questions. It is good to talk about running and hear others experiences ( that’s why I blog and read other blogs.) 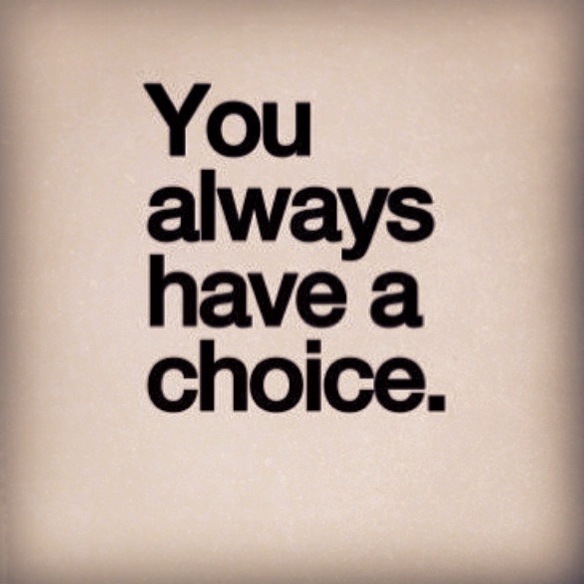 However, it is really important for you to try different things and figure out what works best for you. 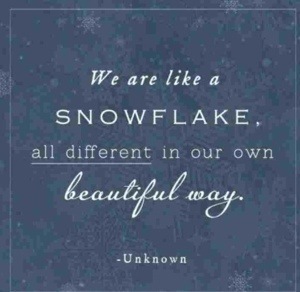 You are your own unique person, one of a kind. When it comes to running one size doesn’t fit all. And diversity in this sport is one of the reasons I love it so much! 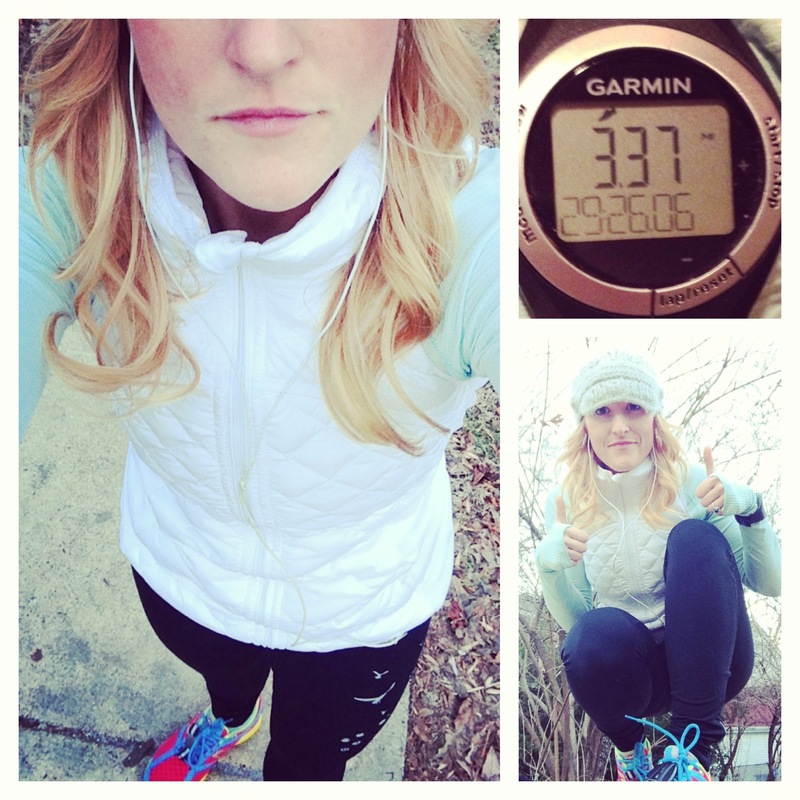 What is your most common running question? I woke up early, right when the sun began to rise. As my fiance peacefully slept, comfortably sunken in a bed, hidden by blankets, I snuck out as quietly as I could. Tiptoeing around the hotel room, grabbing my iPod and garmin. Heading to the beach isn’t hard when your resort is ocean front. After spending five days in Bangkok and four days in Chiang Mai where I struggled to get a workout in, my legs were craving a hard run. I couldn’t wait, finally it was time. 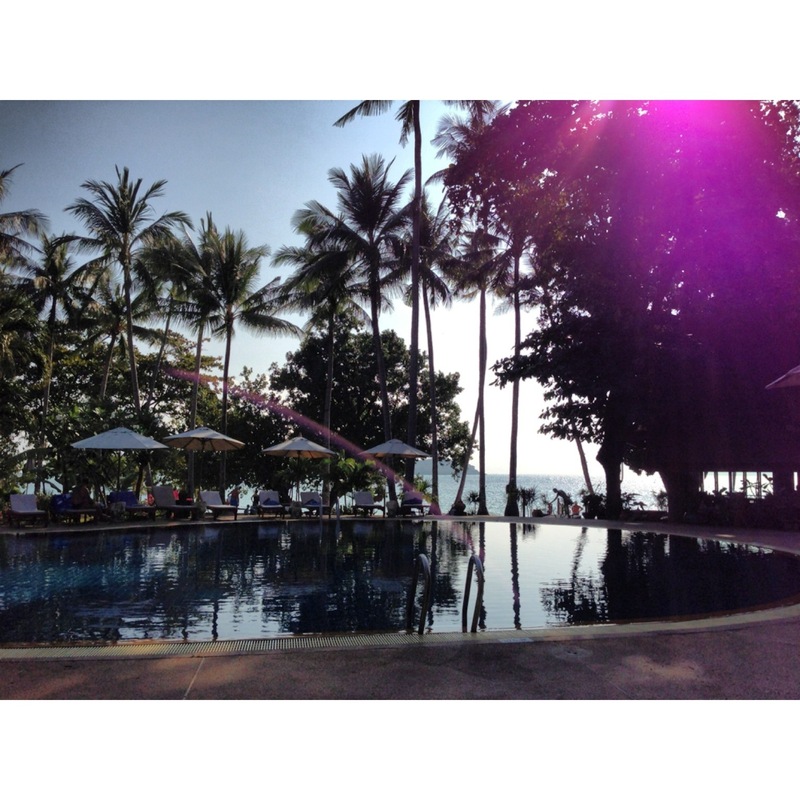 When I was on Ko Samui, I ran three out of the four days I was there. The first two days I wore my Newton shoes. The third day I didn’t have time to run because we spent the day deep sea diving in Ko Tao. The fourth day I ran barefoot. The beach was not a long beach like you would find on the East Coast of the USA, where you can run for miles and miles. Instead it was very unpredictable. When I ran to the right of my resort there were times when my beach disappeared and just turned into deep water. However, when I went the opposite way I was able to get more than 2 miles in before I turned back. My runs were short and fast. Because it has been such a snowy brutally cold winter, here, in The States it took me a little bit of time to get use to the heat. However, once I got use to it, I loved it! 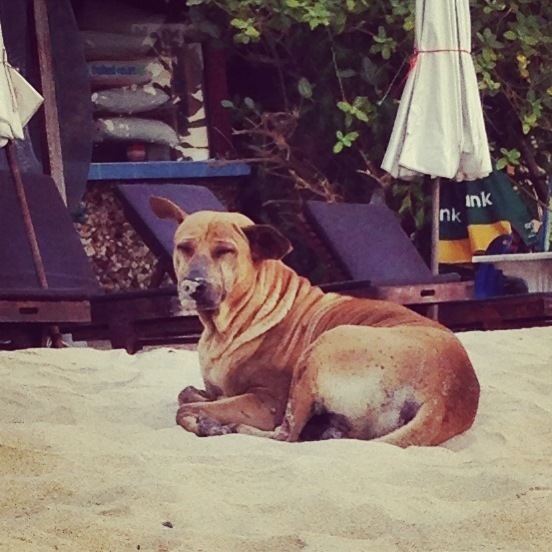 On the last day on Ko Samui, I saw the cutest thing. It was so early in the morning that I saw a couple dogs sleeping on the beach. As I went over to snap a photo this one began to wake up – all sleepy eye with sand on his nose. If I were him, I would sleep on the beach too. What a beautiful, peaceful place. Once we left Ko Samui, my fiancé and I headed to the beautiful Island of Phuket. There we met up with my best friend, Mariana, and her husband Chris. I was very excited when they both agreed to run with me. They are new to running, but open to the idea, so we met up and ended up doing a total of three morning runs. I alternated running barefoot and with shoes. 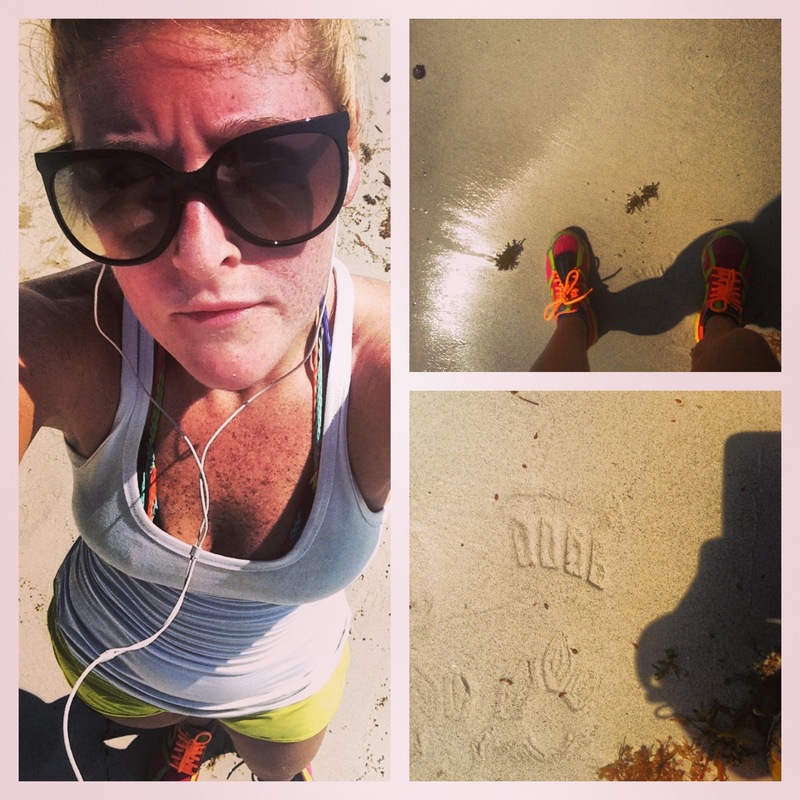 We mainly ran on the beach but there was a time we ran on a street that went along the beach. I was proud of Mariana and excited she was so interested in running. 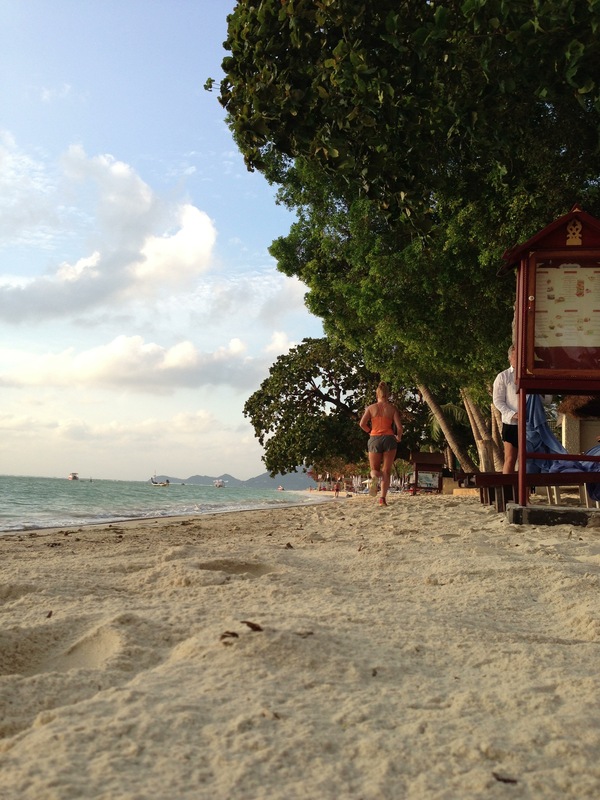 In the end, I really enjoyed running on the Islands of Thailand. It was a beautiful place to run. 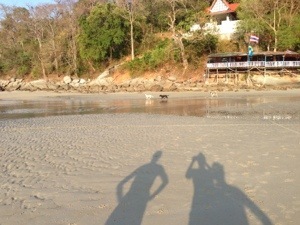 It was peaceful running along the beach totally alone in Ko Samui. 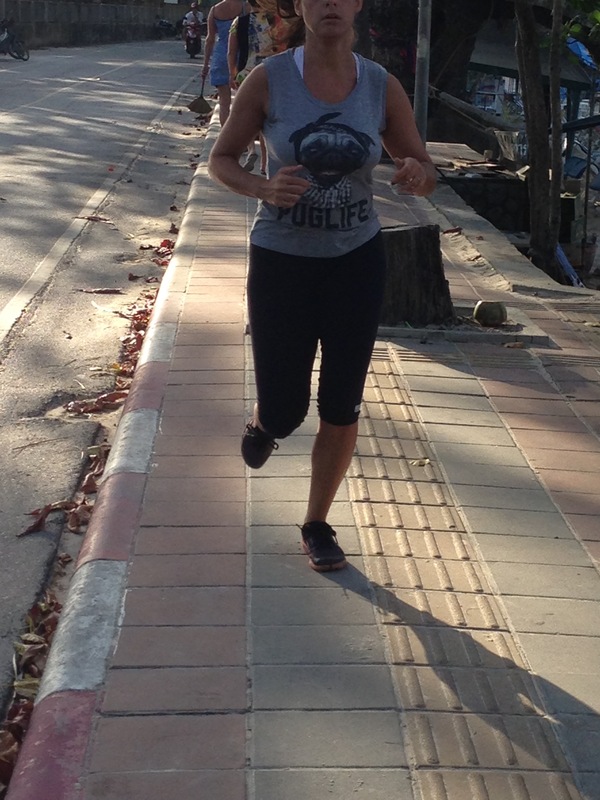 I had good company running on the Island of Phuket and was happy to inspire my good friend to begin running. Phuket was also full of other runners it was fun seeing us take over the beach in the early morning. 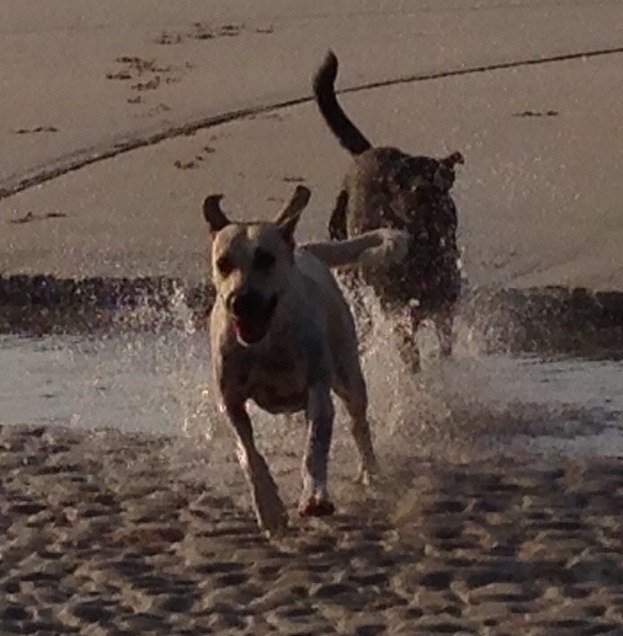 Not all the runners on the beach were human. I’ve already missed the feeling of running barefoot in Thailand. As I deeply inhaled the salt water air, sweat dripped down my tan skin. The wind blew through my hair. Waves crashed at my running feet. Sand stuck in between my shoes. I was quickly reminded how lovely it feels to run barefoot in shorts. I am writing this post in the Airport waiting to board my plane. This will be a long 24 hours of travel. Over the last week, I have had many people ask me what am I going to do for workouts while I am away for three whole weeks. Well first of all let me just say that taking a 2-3 week break from working out and running can be healthy for an athlete who is in good shape. This rest is sometimes needed to avoid burn out. It is healthy physically and mentally. 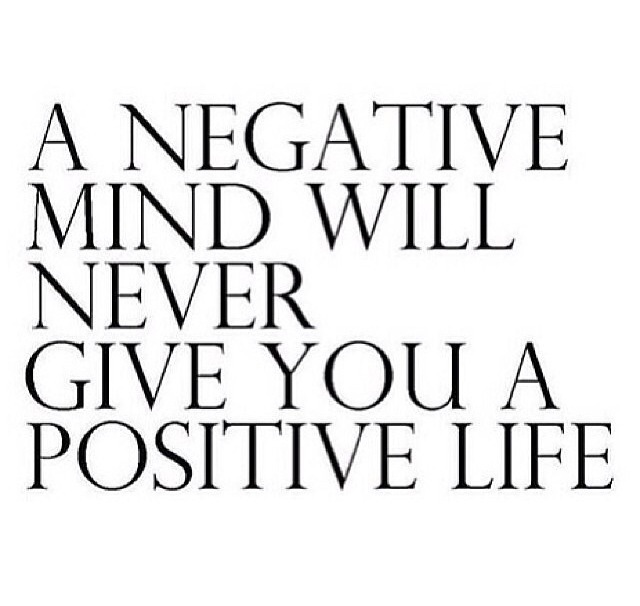 However, emotionally, passion kicks in and you crave a good workout or run. Or if you are someone trying to loose weight taking a 2-3 week break can really hurt your weight loss progress. And for runners more than two weeks of no training can really set you back. So before you decide to take a 2-3 week break from your workout routine on your vacation evaluate to fitness level and future goals. Yesterday, I worked out hard. I worked shoulders, arms, and chest. I did different circuits for each, 3 rounds, 15-20 reps of each exercise in the circuit. This was the last 3 days of the Livefit trainer. I have officially completed the Livefit trainer 2 times. The second time customizing it to my body. As for working out I am going to enjoy my time away- so none of my workouts will be intense. However, I did bring my running shoes (newton distance u) and my garmin. I am hoping to get in some runs. It will be 80-90 degrees which will be super hot compared to our bitter cold winter we’ve been having in the USA. It will be interesting to see how fast my body can adjust to the heat. With that being said I am looking forward to getting my sweat on. My goals are to try to run through the chaos of Bangkok. Run the mountains of Chiang Mai. I may do some barefoot beach runs. To maintaining girl muscles I will do some body weight exercises such as a variety of planks and push ups. I am also hoping to do some yoga, if possible find a class or retreat. Although, (I ended up not bringing them,) bringing a jump rope and resistant bands are easy items to pack while traveling. So I’m off! See ya in Thailand! 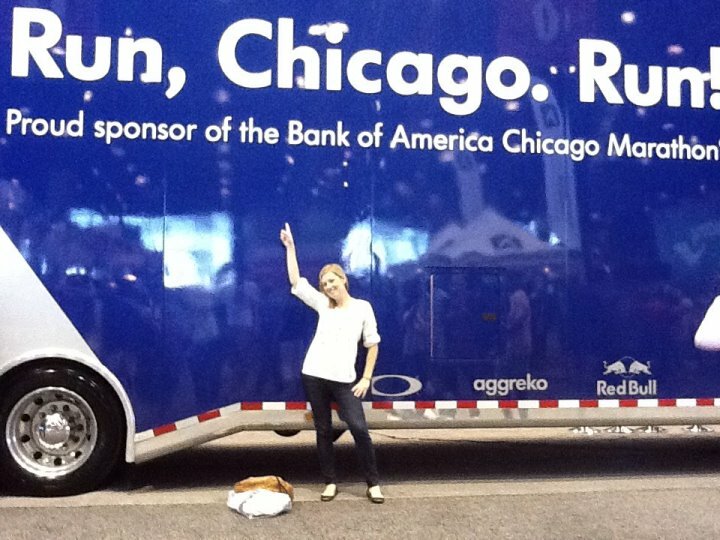 This week the running community’s heart was heavy, after hearing about the death of Meg Menzies. 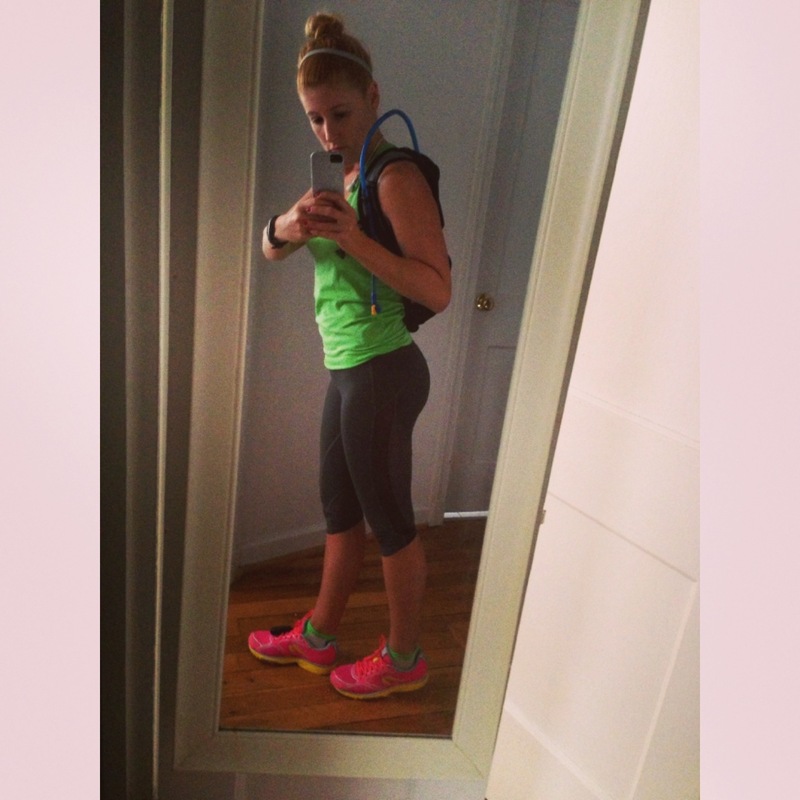 She was a 34 year old mom training for the Boston marathon. On Monday morning while running a 13 miler she was struck and killed by a drunk driver. Although, I didn’t personally know Meg, I ran a quick loop effortlessly in honor if her. Many other runners did the same thing, wearing blue her favorite color. 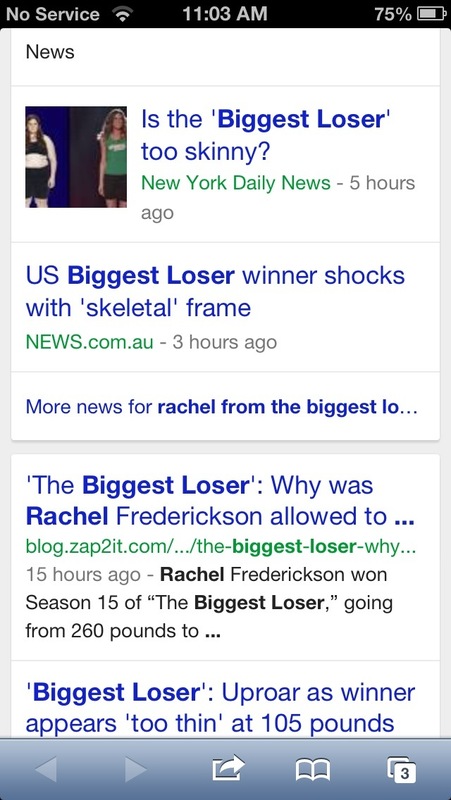 It is a really amazing thing how fast news spreads on social media. I heard her story and was saddened but touched. 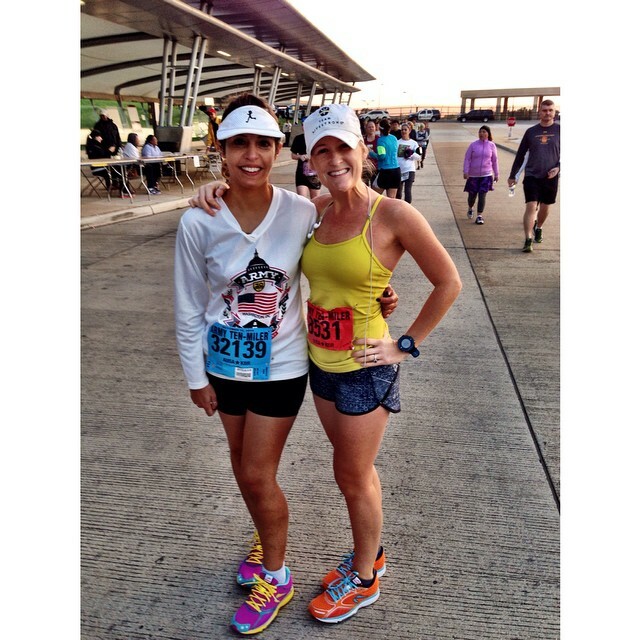 By using #megsmiles the running community ones again stayed connected and was able to share their support. Did you run for Meg? After a long time of not going on Pinterest, this week I was all over it. Looking for wedding inspiration. Making a pin board for Thailand. And of course I couldn’t help but notice all of the fitness pins. I found this one and it really hit home. Runners are competitive athletes. But the only runner we need to be competitive with is ourselves. 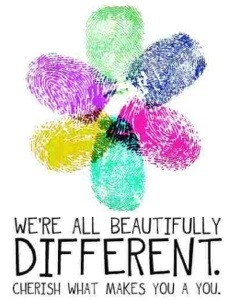 We need to stop comparing ourselves to others. And never be jealous of ones medals, PRs, or distances. As runners, we need to be happy and supportive of each other. Never think of yourself as less then your potential, I use to think I was a 10 min/mile girl, now I am running an 8:30 min/mile. I thought I was one think, so thats how I ran. Now I believe I can run faster, and further. All of the other stuff, like change your shoes, don’t wear cotton, listen to your body, are important and help your run your best. There are many people who make donations to their favorite charity, during the Holiday season. When I was asked what I wanted for Christmas, I realized there is not much that I want or need. It made me feel really fortunate. I am so thankful for this- I am one lucky lady. Because of this I felt a deep desire to help someone in need. So this year, I decided I wanted to donate, and because I am a runner, there is nothing better to give, then my retired running shoes. So I donated them to a company I love supporting, Kind Runner. I am a runner who has a shoe rotation. I am a runner who retires her shoes on average around every 400 miles. This means I end up with a huge pile of retired running shoes. So to avoid looking like a shoe hoarder, I now donate my retired running shoes to Kind Runner. Purchase your next pair of running shoes from Kind Runner. You will receive your new running shoes in a box with proper postage and address. Remove your new shoes from the box and put your old shoes in. Ship it out for free with UPS. Once Kind Runner receives your donation they will e-mail you. Make sure you set up your account with Kind Runner so they can give you kind runner rewards. 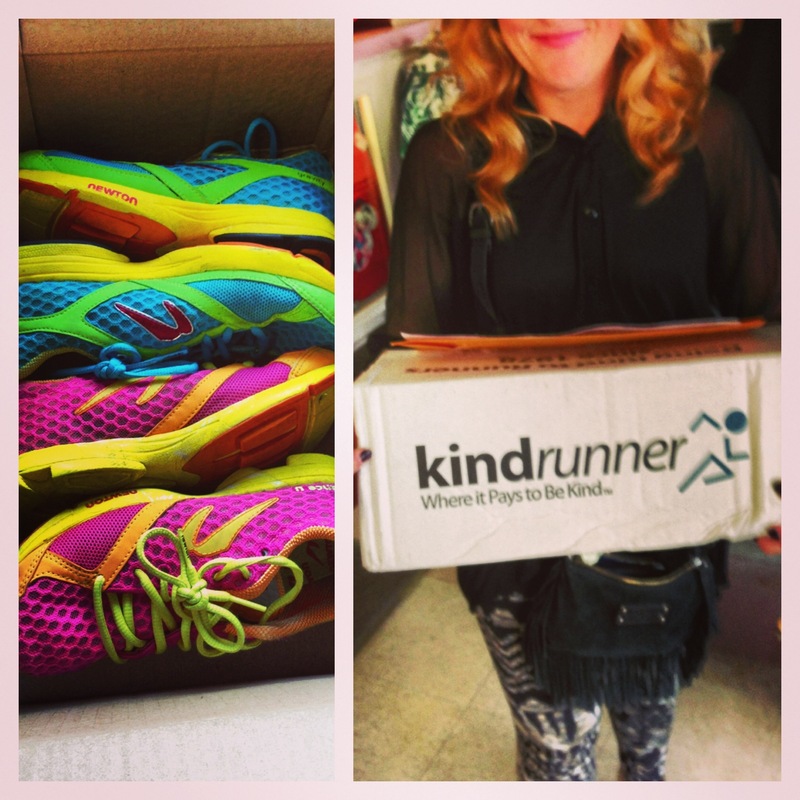 Every pair of shoes you donate you will receive kind runner rewards which can be used towards your next purchase. Always remember to be kind! Happy Running! Do you donate your retired running shoes? Which charity do you donate to, during the holidays? This year’s holiday season was non stop. It actually was the busiest holiday season I have ever had at the salon. Busy is good, but it is also exhausting, and stressful. So when I got to leave the salon early on Christmas Eve, I decided to hit the trail hard. Snow flurries were among the wind blowing, but it was sunny, and I made it just in time to get a good run in before the sunset. I love running at this time. You see a ton of wild life on the water, and this time the sky turned pink- so bright it matched my jacket. This year was the first time that I cut down my own tree. I went once with my family as a kid, but my fiance and his parents have been cutting down their tree for the last couple years so this year I joined them. I asked the farm if they had Douglas Firs. They didn’t, but they had other types of Firs, that looked similar. It was a fun outing, and really awesome having a fresh cut tree. Because work was so busy, it took a whole week to decorate. But it finally got done. It is so relaxing to sit next to a beautiful lit tree. The tree part is one of my favorite things about the Christmas holiday. I also love Christmas Cards! This is a jar of pink, blue, and green pieces of paper rolled up into scrolls. When I am in need of a new song to add to my running mix on my iPod I choose pink, unravel it and there will be a song title and artist. This is perfect because I am always desperate for new music. If I am lacking motivation, I choose blue. I unravel blue and a motivational quote will be there to help me get my booty moving. If I am sore from miles and miles of running, I can choose a green scroll which will teach a yoga pose or stretch. The jar also had socks, and headbands in there as well. This is a home made thoughtful gift and I love it! So creative. My favorite part is the phrase on the front, “Its a runners world, because 26.2 is my lucky number.” This gift is definitely making my Runner’s Wish List next year. So after breakfast and gift exchange, my sister and I went for a quick 5K loop. It was a great neighborhood run- towards the end of the run, I realized how peaceful it was outside. It was also nice to check out all the houses decorated for Christmas. Pacers is the local running store in the DC area. They posted on facebook a status wanting to hear what kind of milage everyone was running for Christmas Eve and Christmas Day. Whoever had the best mileage won a race entry for February or March. Guess what… I WON!! I am so excited! I never win anything! 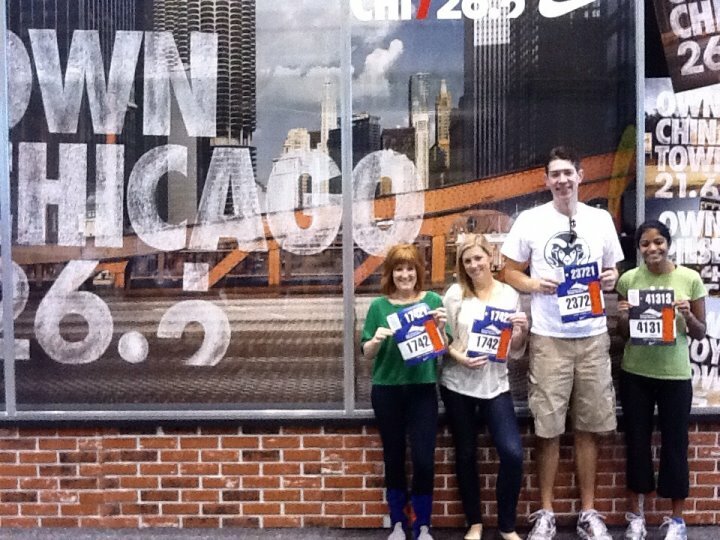 Can’t wait to run a St. Patty’s day race. Thank You, Pacers!!! Are the holidays busy, stressful, and overwhelming for you? What cool running presents did you receive? Have you ever won a free race entry? Do you enjoy New Years? I want to say a special thank you to my sister, mom, and of course my fiance, his parents, and stepsister who gave me gifts this year. All of them were amazing and I have been so spoiled. Thank you! I’m in!! The Cherry Blossom 10 miler was my very first race and I have been running it every year since. Because of popularity the last couple of years race organizers have changed the race from first come first serve to a lottery. I am always nervous I might not get in, but thankfully I got lucky. 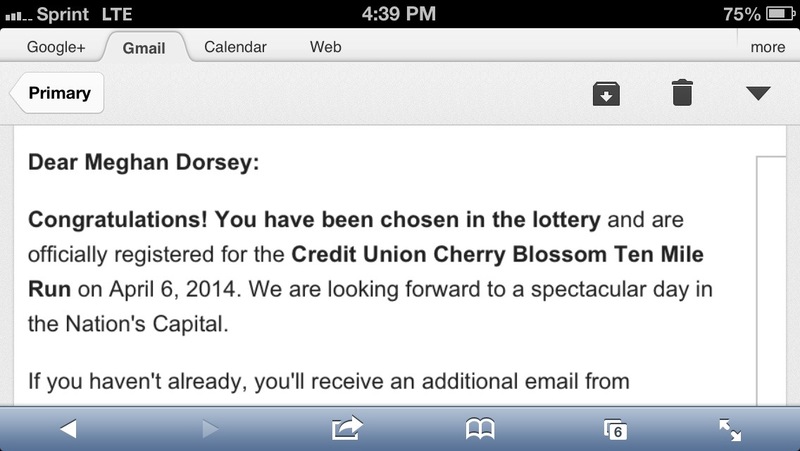 This will be my 7th time running the Cherry Blossom 10 miler! I now have spring fever. I am super excited for this race and more to come. I am also looking forward to announcing my future races for my running season with you guys after the holidays! Is anyone else running the Cherry Blossom 10 miler? 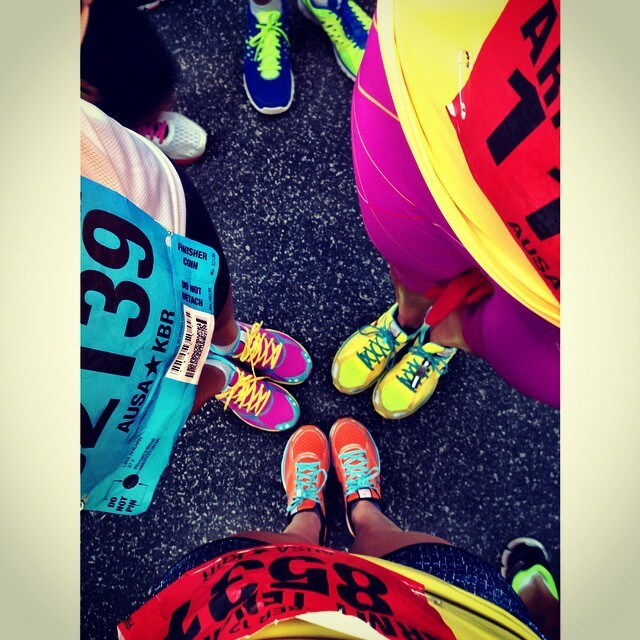 Do you have a favorite race you run every year? 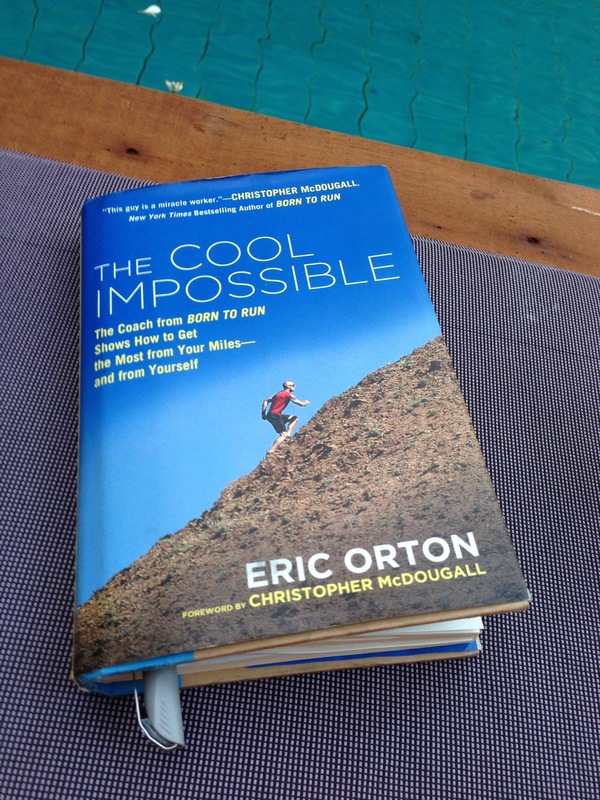 Lately, most of the blog posts I have been reading are about tapering. This is because most of the blogs I have been reading are running blogs, and most of the runners who write them have been tapering for a fall marathon. Now it is my turn to taper. Last week the beginning of my taper felt nice. I had more time in the morning to get ready for work, because I was running shorter faster runs. I thought to myself I love tapering! This week I hate tapering. I know my body needs the rest, but I am feeling antsy. I am ready for this race. I am ready for my fun weekend to begin. It feels weird not having any serious weekly runs. Running gives me energy, and all this rest is making me feel tired not energized. A lot of non runners have asked me lately, “What does taper mean exactly?” Well I found the above taper photo and thought it explained it perfectly. T- trust your training : That is exactly what I am doing. At this point, my training is done. There is nothing more I can do to increase my fitness level, my endurance. Last week, I did shorter, faster runs, to get my fast twitch muscles moving and keep my legs from getting heavy. This week I am only doing shorter easy runs for my mental state, to keep my confidence high. 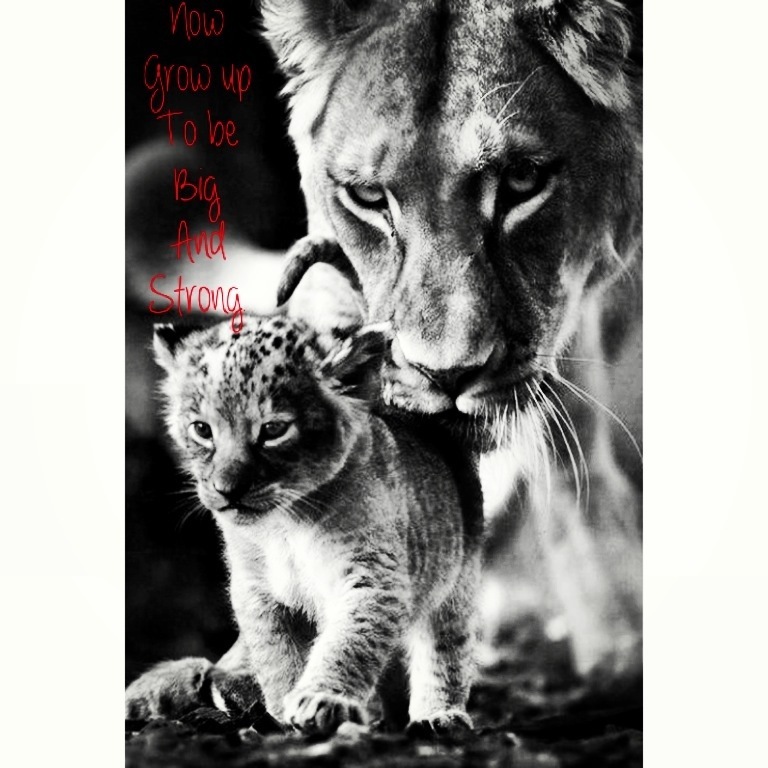 Trusting in my training gives me some sort of comfort. I am trusting in my training, because I trained hard, never missing a long run – I put the work in. Along with that I will follow exactly what my training plan tells me to do. I have run two other marathons using this training plan, and they were successful, so I believe in it. Yesterday, I ran a little more than 3 miles. Tomorrow, I will run 4 miles. Friday, I will run 2 miles. 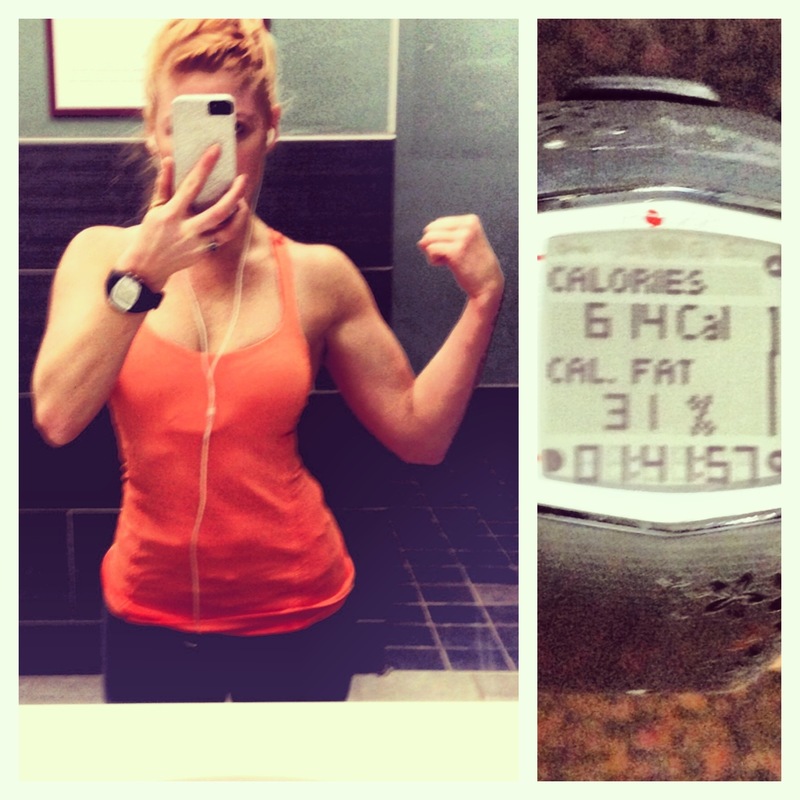 A – adjust your calorie intake : At this point, in my training, I am not strict with my diet. I can’t be. I have been running 20 mile runs, which burns 2,000 calories. So I have been eating three meals a day, snacking when hungry, eating well balanced meals. I am still eating all organic, mostly plant based meals, but I have been listening closely to my body. If I crave something I eat it. When running this high of mileage, if you crave something – for example something salty, most likely your body needs salt. Friday I will start my carb loading. I will have pasta for Saturday night dinner as well. Sunday morning, race day, I will bring with me a bagel with peanut butter. I have tried hard boiled eggs, yogurt, pb&j, all of these work fine, but I trust in bagel with peanut butter the best. Starting tomorrow I will make sure I stay hydrated and start really focusing on my water intake. You’ll see me with a water bottle everywhere I go. 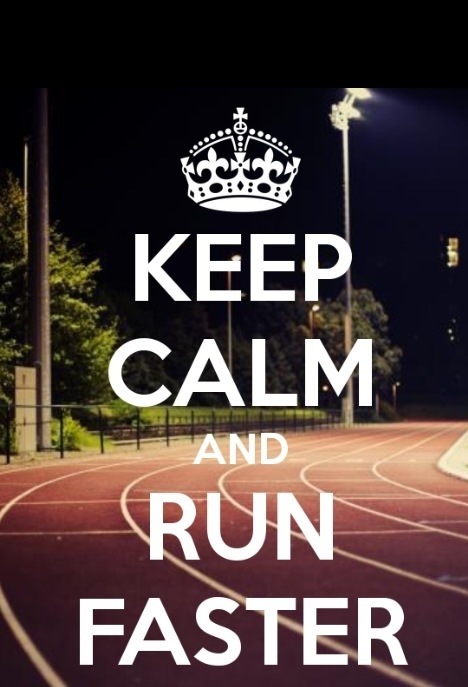 P – perfect your race day strategy : I will be running this race by myself. However, this is my 3rd time running this race, and I have run several races in this area. I have an advantage because this is where I am from, so I am comfortable and know my way around. I was talking the other day with a client of mine who is from the area and also runs Marine Corps Marathon every year. She too loves how it is familiar and easy. Just wake up and head over to the Pentagon. However, I’ll hit up the expo on Friday. Once I get my bib and packet I will read everything, to get a better idea of everything that will be going down that day. On Saturday night, I will prepare everything for race day, so I am ready Sunday morning, this will include creating a fresh new running mix for my iPod, and getting my race outfit together. I plan to write a separate post about the Marine Corps Marathon Expo and about my mental strategy for running the race, so look for that on Saturday. E – embrace your free time : I definitely have been sleeping in and enjoying having more time to get ready for work instead of rushing there after a run. I thought my min pin would have made the perfect accessory to my work outfit. His spiked collar matched my leather pants. R – rest and recover : I have been trying to sleep in. I have been trying to take it easy on my runs. I plan on going to bed early Friday night and Saturday night. A good night sleep is more important on Friday night. I will be antsy the night before my race, so the odds of me having a good night sleep will be slim. So that is what taper means. However, the other thing I have been doing is checking the weather. The other day on the news they did the weather and placed the MCM logo on the weather map for Sunday. So far if anyone cares to know it is starting to get chilly. Today felt cold. But the colder the better. The weather man is calling for a low of 44 and a high of 59 on race day, I’ll talk it! So thats what has been going on for me during my taper week. Do you enjoy your taper weeks? or do you hate them? On Tuesday, there was tons of chatter that because of the government shutdown the Marine Corps Marathon was in jeopardy of being canceled. The organizers made a statement on their Facebook page saying they were exploring other possibilities. However, because of the large size (30,000 runners) of the race, and the fact that the long distance would be ran mainly on federal land it would be difficult to come up with an alternative route. Last year, I understood the reason for canceling the New York City Marathon. Sandy caused devastation to the city and if the marathon went on it would have brought more chaos to an already chaotic city. But on Tuesday, I also understood the feeling of disappointment the participants of the New York City Marathon must have felt, that day. Because on tuesday, when hearing that the race I am registered to run, the Marine Corps Marathon, was in jeopardy of being canceled I began to panic. I felt angry because no natural disaster was preventing this race to go on, instead our government was. The roads are fine, the race is paid for, volunteers are ready, 30,000 runners have spent their summer preparing to run, some from other places who already have hotel and flight arrangements. I was angry, disappointed, and in panic mode. The Shutdown has gone on long enough. The Marine Corps Marathon organizers promised they would make a final decision by Saturday the 19th, and notify participants the status of the race. On facebook people were voicing their opinions about what they plan to do if the race is canceled. Some said – we should all show up anyway, 30,000 runners, should just run the course anyway. I know people were just trying to make their point, but just running the race anyway made me feel worse. Hell no, I want my race timed. So I was thinking of plan B. If MCM was canceled I would register for the Richmond Marathon. Richmond is scheduled for November 16th and registration is still open. Although, Richmond is not as exciting for me as MCM, it is still a timed (Boston Qualifier) 26.2 miles. Phew… The government ended the shutdown last night and this morning the Marine Corps Marathon organizers announced the race was back on! A special thank you to MCM and MCM10K participants for your patience during the recent period of uncertainty. It is with great pleasure that the MCM can officially announce we are on. We are SO on. See you at the start line! A video announcement: Watch here. So I am excited again. Can’t wait to do the damn thing! Also, I want to make clear that this is a running blog and that is why I am writing about how the government shutdown has affected the running community. I don’t want to get into politics on here, but I do want to make clear that although running is important to me, it is nothing compared to those that were furloughed. There are bigger and more serious issues going on, that don’t just effect our nation, but effects people globally. In the end, I am happy things are starting to go back to normal around here. I hope everyone who was furloughed had a good first day back to work. I have realized that during this marathon training season, the times that I had not so good runs, weren’t really about my physical strength, but rather my mental weakness. On Saturday, October 5th, I ran my final super long run, with the mind set that it is going to be a good run. I just knew it was going to be that way, I felt excited and eager to get out there. My garmin recorded 20 miles, however I think I ran at least 21 or maybe even 22. The reason I say this is because while looping around the Jefferson I looked down at my watch, and it had been stopped. Anyway, whatever, 20, 21, 22, its all the same. They are all in the 20s and so is 26.2. What I mean by this, is at this point in your run, you pretty much are either hitting the wall, or in the zone. The zone is where you want to be. It is when you are preforming at your peak ability. This is why we run, as runners – this is what we are all chasing. On this 20 plus miler, I must have been in the zone… because during this run I didn’t desperately want it to end like I do sometimes when I feel bored or hungry. After I finished this run, even though my legs were jello and in pain, I could only describe myself as good, happy, excited even. Because of the Government Shutdown, the running trails that I normally run on were closed. I did see people sneak on the trails, but I decided to avoid them. This took me out of my comfort zone and forced me to find a new and exciting route. The night before I decided to use the Map my Run app to figure out a way to fit 20 plus miles in from my house to the National Mall. I live right on the other side of the Potomac… being so closed to DC, made me concerned I wouldn’t have enough miles, and my run would end just short of 20. Another dilemma, the October Heat Wave. Because it would be 90 degrees by noon, this forced me to get out of bed bright and early. I struggle in the heat. In my early 20s, I use to be able to do runs on code red days without eating breakfast, but now in my late 20s, that just sounds like torture. So I crawled out of bed, grabbed my iPod, Garmin, Camelbak, and I headed out the front door. I ran from South Glebe to North Glebe. Then I made a right down North Quincy. Made the next right down Wilson. I passed North Side Social heading toward Clarendon. Ran through Clarendon down to Court House. I passed Court House, running down to Rosslyn. Made a left at the bottom of the hill, ran straight over The Key Bridge. At the end of the bridge I made a right on M street. Ran through George Town on M until I hit Wisconsin. Made my next right on Wisconsin and ran down to the George Town Waterfront. Made a left and ran passed the Waterfront. Ran passed the Kennedy Center towards Memorial Bridge. Right before the Bridge I crossed the street to hit the National Mall. I made a right and headed to 14th Street. On 14th Street I headed towards the Jefferson and then jumped on the 14th Street bridge. I ran across the bridge (South) towards VA.
Then I ran the Tidal Basin. I passed the WWII memorial. I passed the reflection pool. I headed over the Memorial Bridge. I made a right and ran through Arlington Cemetery. I ran up to the Iwo Jima memorial. I ran down through Rosslyn. Then I ran up hill. I made a left on S. Quincy. I made a left on North Glebe. I finally arrived back at South Glebe. 20 plus miles in 3:30ish. The Lincoln, Reflection Pool, WWII memorial. This run was really fun because it was a new route. I also hit up a lot of the monuments and memorials that I normally see from the other side of the potomac. After I stopped my Garmin. I walked a half mile back to my house. It felt good to walk, even though it was up hill. I live in a very hilly neighborhood. But walking after a long run is very important. When I got home, I chugged a bottle of water. Although, I drank plenty of water while I was running, it is very important to stay hydrated in order to avoid lactic acid build up in your legs, which later causes soreness. Then I took a shower. After long runs I always put my shower on as cold as I can. Cold ice water is good for the muscles and helps reduce inflammation. Oh wow, this felt truly amazing. This long run was bitter sweet. The reason why is because it was my last super long run before the marathon, which means my marathon training is coming to an end. However, I also felt excited because now my super long run is over and the marathon is right around the corner. Yesterday, marked 20 more training days, which means taper time – it’s all down hill from here on out. Woohoo!! So for the next 20 days, I am going to be doing short faster runs. I will also include hill work in most of my runs. Because my runs will be shorter, I am going to put a more intense focus on weight lifting, doing active rest periods, and circuit training to build endurance. I will keep my training and nutritional goals on point. It’s grind time!! Is the Government Shutdown Affecting your Running? I am from the DC area. Most of the time, I love being born and raised here. But some days I hate it. I hate that the majority of the people I come across in some way for the government. I hate that when I go to a comedy show, it is ALWAYS jokes about politics. I hate how everyone is a work-o-holic, being career driven is not a bad thing, but have some balance in your life. I hate when I travel to a different city, such as New Orleans, Miami, or Las Vegas, and I tell people I am from Washington, DC, they automatically start ranting their political views. On another note, one of my favorite things about the DC area is the running community. This is a running city. If you are a city runner, you can do a loop along the national mall around the monuments. If you love running over bridges, try running the Key Bridge, Memorial Bridge, 14th Street Bridge, or even the Woodrow Wilson Bridge. If you want to visit Arlington Cemetery you can run through it. 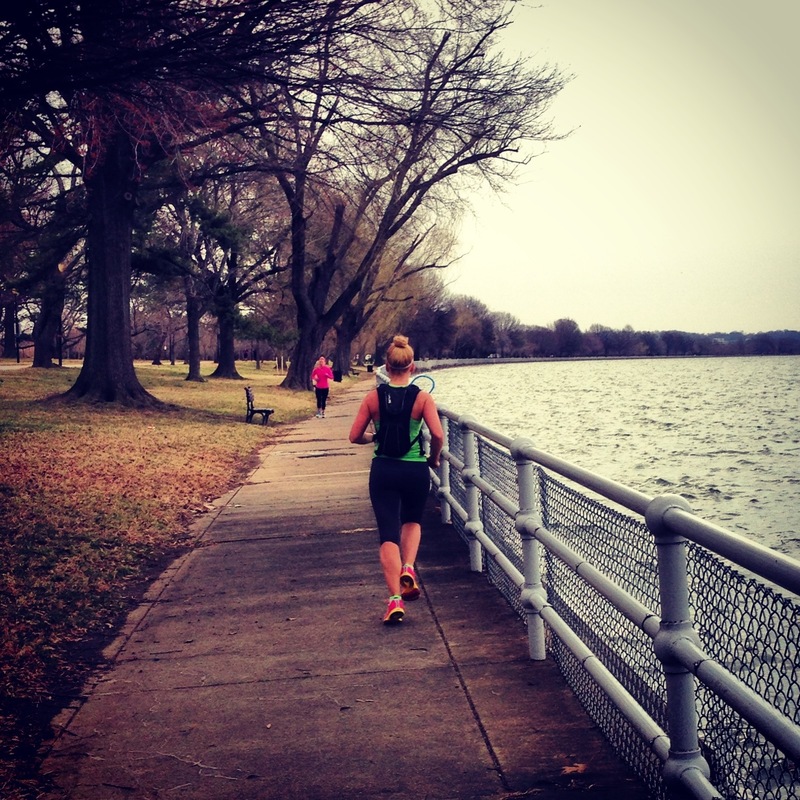 If you love running along water, try the Mount Vernon Trail which takes you right along the Potomac. Rock Creek Park is a trail that takes you right to the National Zoo. C&O/Capital Crescent Trail is shady and scenic. We are also blessed with a variety of popular races, that runners from all over register to run every year. Tomorrow, I plan to run my 20 plus miler, for my marathon training. However, because of the Government Shutdown the trail I was planning on running, is closed, because is a National Park funded by the government. Many facebook status’ are mentioning how park police are ticketing runners/cyclists that are on these bike paths/running trails. These trails include, the Mount Vernon trail, C&O/Capital Crescent Trail and many others. So I guess I will have to hit the sidewalks of DC to get my run in… I’m just thankful I am not running a race through one of these National Parks this weekend. Runner’s world reported some of these races have been canceled. And hopefully this Shutdown won’t affect the Marine Corps Marathon – the marathon I have been training for, which is scheduled at the end of this month.